Totalcontent | … not forgetting the Royal Mail Year Book and Year Pack. 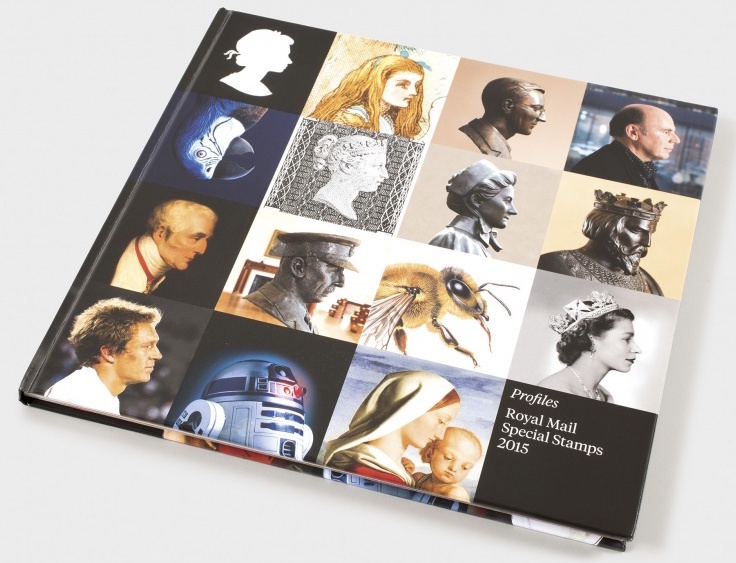 Home » blog » … not forgetting the Royal Mail Year Book and Year Pack. One of my perennial pleasures is contributing words for Royal Mail’s Year Book and Year Pack. Each takes a slightly different look back at the stamp issues of the previous 12 months, but they are both beautifully produced labours of love, conceived and executed by some of the very best design talent in the UK. All this, and you get a full set of the year’s stamps into the bargain. In 2015, as well as crafting the introduction, interviewing the stamp designers and relaying their individual stories, I penned two chapters of the Year Book. On this occasion, the book was deftly designed by Purpose. The theme was ‘Profiles’, taking the familiar profile of the Queen’s head on British stamps as its conceptual starting point. So each chapter featured a written profile of a person or character associated with that month’s stamp subject, together with a side-on photographic image. It proved a really effective way of unifying such disparate subject matter. My first chapter covered British bridges, and involved interviewing and profiling Jim Eyre of prominent London architects Wilkinson Eyre (that’s him in the top-right corner above). Over the past 20 years, the practice has designed some of the country’s most iconic bridges, including the Gateshead Millennium Bridge, the Swansea Sail Bridge, and the Peace Bridge in Derry-Londonderry. And the latter bridge — a spectacular exercise in engineering and symbolism — provided the focus for the chapter. Jim proved a charming, thoughtful and informative interviewee, giving me fantastic raw material to work with. It felt like I was going back to my roots as a design journalist. The second chapter was more unusual, and shrouded in the utmost secrecy. Emails were encrypted. NDAs signed in triplicate. Passwords de rigueur. At one point I was couriered a virtually impregnable military-grade USB stick with layouts. Yes, I’d been tasked with writing the Star Wars chapter, months before The Force Awakens was released. The profile in this case was of the redoubtable R2-D2, the cute white and blue astromech droid who has played a pivotal role in all seven Star Wars movies. As a seasoned Star Wars fan, the chapter was great fun to research and write, and I picked up plenty of fascinating trivia and mythology along the way. The Year Pack poses quite different challenges. The main one being brevity — 150 to 200 words is not a lot in which to condense, say, the Battle of Waterloo. The angle and approach needs to be different to that of the Year Book, too … so finding an interesting, original hook for each entry is critical. Fortunately, this year I was paired with two of my favourite creative partners. The estimable Jamie Ellul of Supple Studio handled the design, while Robert M Ball took on the illustration with his usual aplomb. The pack is subtitled ‘A First-Class Exhibition’ and features a series of characters, based on this year’s stamp subjects, walking through a gallery admiring representative images. There’s more to read about the 2015 Royal Mail Year Book and Year Pack on the DesignWeek website. And you can buy your very own copies by following this link to the Royal Mail web shop.